“The tie or necktie is a long piece of cloth worn for decorative purposes around the neck, resting under the shirt collar and knotted at the throat.” Wikipedia. So many costumers find themselves all in knots when in comes to the knots! 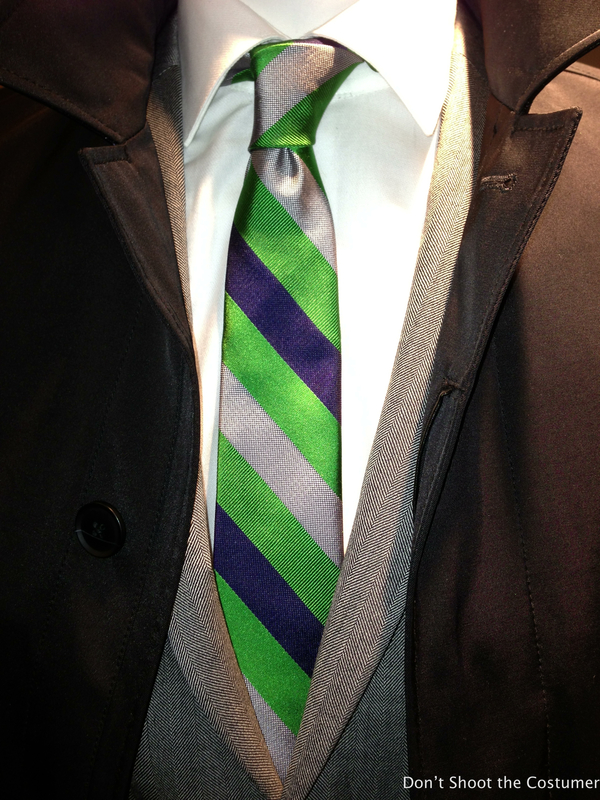 The Tie… yes with a capital (my husband always makes fun of my capitals! I think this costume piece deserves a capital)… is a statement piece that can play an important role for the costume and the character. 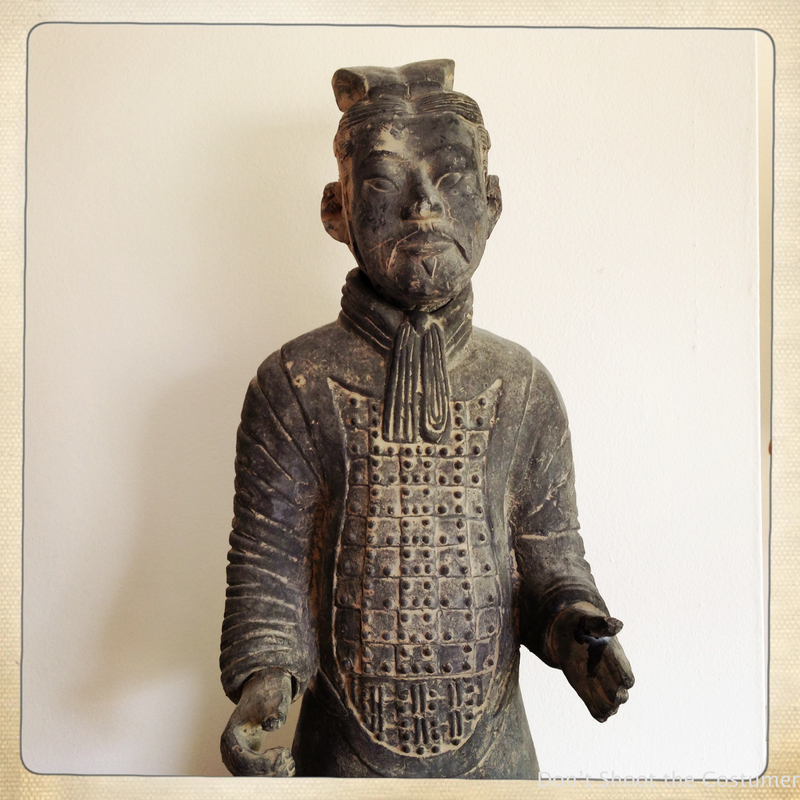 In 1974 the tomb of the first Chinese emperor, Qin Shi Huangdi (259-210BC), was unearthed. The archaeologists found that the terracotta soldiers were carved with a smart knotted scarf. This era is being credited as the first physical documentation of the tie. After going through years of evolution, the tie as we know it is said to have started around the time of the industrial revolution… and in 1924 a New Yorker named Jesse Langsdorf patented the tie pattern that we still use today. If you’re working on a contemporary show you’re most likely going to end up dealing with one kind of tie: long and silk. Maybe a bow tie if you’re really lucky! What really matters to you is learning how to tie those ties! I am working on a show that is all kids… well, some teachers… in a private school. The other day while dressing the background players one of the kids said to me, “Which knot would you like, a Windsor or a Half Windsor?” I took me a few minutes to stop from being mouth agape. Now-a-days most men don’t even know how to tie a tie, so the kid really impressed me. For us as Costumers, there is a lot of thought behind the choices of ties and knots! Each knot is unique by how it sits on the neck, how it looks on camera and, most importantly, as a character choice. – This is strong knot for important figure. It is a sign of power and confidence. – A smaller knot than the Windsor though still symmetrical. – It hangs straight and square when seen on camera. – This square knot still shows power and confidence with out the large size of the Windsor. – This is a good knot if the tie silk is too thick for a Windsor knot. 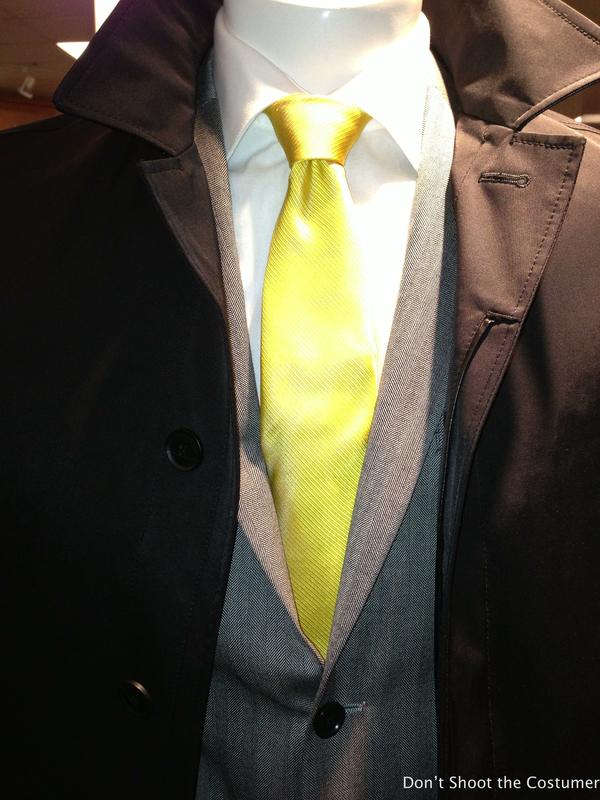 – If you have tall man the Shelby knot uses less of the tie length. – A smaller knot than the Windsor, though slightly bigger than the Shelby. – This knot sits with a slightly asymmetric quality when viewed on camera. – This knot always looks off center when seen on camera. Often a costumer is asked to straighten this tie. – Usually works on a younger person or one that doesn’t normally wear a tie, often used by a person who does not know how to tie a tie properly. Grab a tie and start tying! Learn how to tie some basic knots both on yourself and on your cast. At some point while standing on set you will have to remove an actor’s tie and put it back on again. Trust me you’ll want to do this with ease. • The knot shouldn’t be too large or too small (unless this is a character choice), and should rest snugly on the throat between the collar points. • Spread collars need a larger knot to fill the gap. 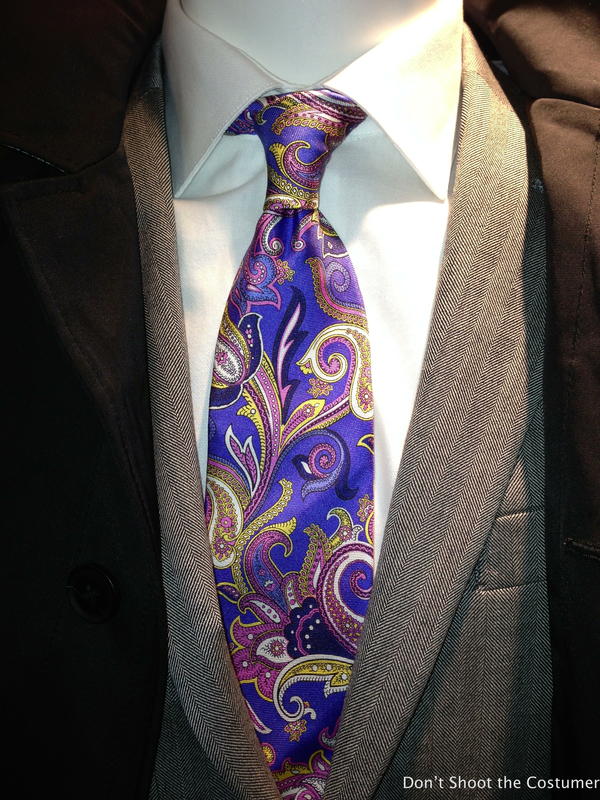 • Having a pronounced dimple on the tie just below the knot is good for the look of the tie. It also gives the sound department somewhere to put their mic. Have fun tying one on today!! Having some fun at lunch on the set of WORDS AND PICTURES, with our cast member Navid Negahban and producer Gary Cogill. There are some wonderful books on ties and knots available. 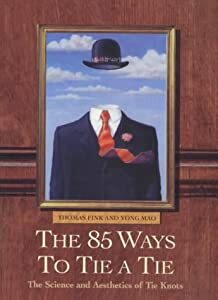 The book I am after is called 85 WAYS TO TIE A TIE by Thomas Fink and Yong Mao… just think of all the interesting thing that are in there! Take a look at this blog, TIE STYLES: An Easy How-To Guide, it will give you a laugh. I love this writer’s opinions on how a giving good tie makes the ladies drool! For some fun I’ve added a crossword puzzle all about ties and their history. Print it out and see how you do, it’s a challenge! All the info came from a book called – HOW TO TIE A TIE – by Daniel K. Hall. I will post the answers next week. Note: At least one answer is included in the blog. This entry was posted in Enkindle, The whole Sheblog!, Think and wonder! and tagged 4-In-Hand, actors, bow tie, costume, costume department, costumer, Cosutmers, film, Half Windsor, Half-Windsor knot, history, Knot, knowledge, learning, Navid Negahban, Necktie, Pratt, Pratt knot, set supervisor, Shelby, simple, terracotta soliders, Wardrobe, Wardrobe Department, Windsor, Windsor knot, Words and Pictures by dontshootthecostumer. Bookmark the permalink.